For most of the last 4 years, I've been trying to wrap my head around how Defra builds services that meet user needs and support the outcomes Defra exists to bring about - benefits for the environment, the economy, for health, wellbeing and society. Like many colleagues, I believe we've made good progress in transformation; but also like many colleagues, I believe there's a lot more we could do to change faster and better. In this post, I want to explain what I think needs to happen, why it should happen, and how it should be done. We design whole services, from end-to-end: this means from when the user starts trying to achieve a goal to when they finish - including both content and transaction agnostic to the department providing it. From front to back: this means the user-facing service, internal processes, supporting policy or legislation and organisational, financial and governance structures of the service. And in every channel: digital, phone, post, face to face and physical elements. The point Louise was making was that effective transformation comes about only when you think deeper than just websites and digital services. Addressing “internal processes” and “supporting policy or legislation” means involving a much wider set of people from all parts of an organisation. That means re-shaping the entire organisation, not just delivery teams, to focus on delivering for users. In my view, we're never going to be able to deliver whole services until we start working as a whole team. Both of those are reason enough to change, but if you want a more concrete example, let me tell you a little story. Some time ago, a colleague of mine was invited to a meeting between the policy people and the operational people for a particular service. The idea was to make sure that everyone had that shared common understanding of how the service worked, pending some substantial work to change it. Long story short: there was no shared understanding. The policy people had one view of how the service worked, defined by what was written down in their official policy documents. The operational team had a completely different view. Over years, they had been dealing with this policy in the real world. They had implemented their own work-arounds and shortcuts to deal with problems that policy on its own had not anticipated, and couldn't quickly be changed to cope with. My colleague sat open-mouthed in the middle, incredulous that two different teams working on the same government service had such different experiences of how it worked. The key words in that last paragraph are "two different teams". So far, the focus of transformation (in various government departments, not just Defra) has been on IT change. Sometimes it includes a bit of org-chart style change where responsibility for one box of people is moved from A to B. Each of those is fine in itself, but neither of them provides the deep-level “whole service” thinking that Louise was talking about. I think the way to deal with that is to create agility at the service level. We’d have teams empowered to decide for themselves what needs to be done, and how it should be done, based on user research and iterative agile working. Not based on endless consultation with endless different governance boards, budget holders and business cases. We’d free them from those bureaucratic cages. Break down functional silos. At the moment, teams managing things like policy, HR and finance are separated from teams doing delivery. Make sure every service has an accountable service owner - someone senior enough to take responsibility for everything that might affect the way we deliver the service to users. Not just the things we traditionally think of as "delivery" tasks, but everything that would automatically be included if we followed step 1 and broke down the functional silos: policy, finance, everything. They own the service, they own the user needs it meets, they own the benefits it brings and outcomes it seeks to achieve. Ask "Why?" more often. I don’t think I need to explain this one. To sum up: I think we need agility at service level. Agile ways of working are too useful to confine to delivery teams. We should be empowering and allowing everyone in Defra to work in agile ways and enable whole teams to work on whole services. It means putting accountable service owners in place, who have authority over everything necessary to deliver a service - not just the software and hardware, but the people, the money, the policy and everything else. I didn’t intend to do this when I sat down to write this post, but I suppose what I’m doing here is calling for radical, sweeping change. But if you look up “transformation” in the dictionary, it says “a marked change in form, nature or appearance”. Radical and sweeping is part of the deal. It's been said that good change comes from the bottom up, and I completely agree with that. I’ve seen it happening and it makes me smile every time. But: you can only get so far with bottom-up change. You also need some top-down change, to remove the blockers that get in the way. When those two sorts of change meet in the middle? That's when the magic happens. 100% agree Clare with your post. In the Civil Service at the moment we are under going a digital transformation (for the better) and alongside that we need sweeping work/service transformations too. We all should be focused on the User needs not just the business needs and that's where things get in the way. The classic 'well we have worked like this for years with no complaints' has to go and be replaced with 'how can we deliver the service to the user as efficiently and cost effective as possible'. Digital working is speeding up the process but the way we work to achieve the result has to catch up and what you have said has a role in how this can be done. We need more internal teams coming together as well as cross departmental teams working together too. A more 'one stop shop' approach is needed to achieve what we set out to do and always at the top of the list is the user needs. Clare. This is a fabulous post and one that summarises my own views and experiences very well indeed. I'd add that it is possible to bring teams together, and to co-create with customers and generally break down barriers that can traditionally get in the way. But trying to run an agile programme and feel empowered whilst doing so does still feel a little way away in my mind. In my experience there is a fair bit of appetite at all levels to move to a whole service approach. In some areas it is happening, s l o w l y. However, one of the fundamental questions I hear is around 'what is a service? ', or 'how should we divide our services up?'. Hard to identify a service owner or develop a whole service if one isn't sure on the rough scope to start off with (although we do our best!). Some are relatively easy to do, they have a limited set of users, simple set of user needs and it's easy to see where the service starts and finishes. But many are very different - users are not distinct and may have many subtleties in their needs, user journeys vary hugely and take them from organisation to organisation not just across Defra but across Government. Plus the size and impact of the service can also vary considerably. So how do we cut up the service cake and who gets to hold the knife? Once we decide that then we can really start to move forwards on whole service transformation. Great post Clare, spot on. This really chimes with our findings from the Defra Policy Delivery Challenge pathfinder that I am pulling together at the moment, especially the points on service ownership and cross team ownership of outcomes. Great blog Clare. I have felt the pain and would love to see this addressed if we are to meet the challenges facing us. If we want to move forward we must adopt a systems approach. I shall try to explain this in a little more detail (hard to do on a blog, sorry). Every organisation needs a common way of working and understanding of how they work. If this is missing (at any level) it results in duplication, gaps, accountability not being taken at the right place, failure of customer service, demotivated staff, reputation damage, decreased efficiency and effectiveness and so on. A systems approach, if adopted properly, would prevent these issues. 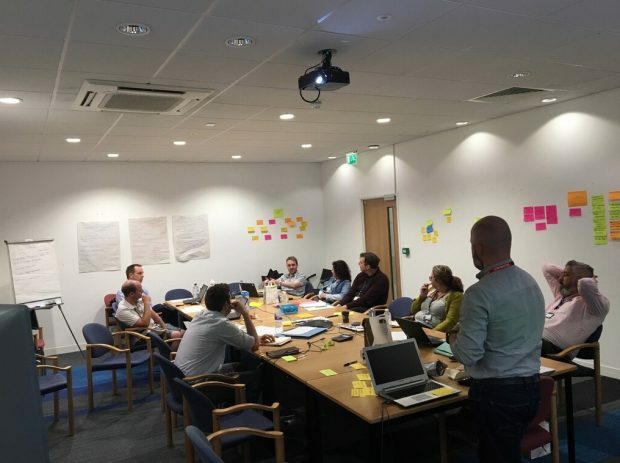 Many parts of the Environment Agency and Defra Group are familiar with a systems approach as a diagnostic tool for understanding an existing enterprise due to the work of the Environment Agency's Continuous Improvement Team supporting the Outcome Systems and Target Operating Model work. A systems approach is commonly used by other commercial and public sector organisations as a basis for their organisational design. This approach can be applied to all initiatives, processes, projects and undertakings, allowing people to understand where they fit in and how they contribute to the other parts of the system. The reason for this is so that nothing is missed and no one is in doubt of their role and how it makes a valued contribution to the overall plan. Every role and job in the organisation will be able to be mapped against a system component and will appear in different places for different systems. Thinking specifically about change, transformation, improvement, (whatever you want to call it), the Framework for Thinking about Systems Change would be really useful at bringing about a structured approach resulting in greater success of change, transformation, improvement work. I can send the framework to anyone who wants to know more. If anyone wants to know more please give me a call (07827355133) or send me an email (ian.mcloughlin@environment-agency.gov.uk). Well done Clare, so good to see you pushing forward these ideas. Your blog certainly resonated with many of my own experiences and frustrations. I recently attended an APM seminar which asked whether you would thrive or survive in a digital world. There was a consensus that in order to thrive organisations will need to develop new business models which is essentially what you are advocating in this blog. Trying to work in new ways (especially the agile approach to digital service delivery) while being severely constrained by a largely unchanged business model is certainly holding back the pace of change. Yes! Another blog post that makes me proud to work with people at Defra and the Environment Agency. I think you are spot on the money with the Silo's theory too. This is great, thank you. Even if I've come to it 17 months late!